Rules for building, placing, and moving ships. Rules covering the acquisition of special victory point tokens. Before you can begin exploring the sea lanes of Catan, you must first construct the board. Each scenario in this book includes an illustration that shows how the board should be built. 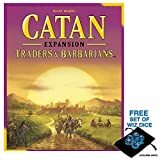 To play the scenarios with Catan: Seafarers (aka "Seafarers"), you need the components from a copy of Catan (aka "Settlers"). Each scenario lists all the components needed to play that scenario. To assemble the frame for a Seafarers scenario, you have to use the six frame pieces from Catan and the Seafarers frame pieces. To use the six Catan frame pieces, you need to turn them over so that the all-sea sides are face up—you do not use the harbors that are printed on those frame pieces. Each scenario illustration shows how the frame pieces should be put together. After you built the frame, place the hexagonal tiles (hexes). Arrange these hexes exactly as shown in the scenario diagram. After you place the hexes, you need to arrange the round tokens with the production numbers. These are also placed exactly as shown in the scenario diagram. After you build the board, randomly place the harbor tokens. Take the harbor tokens listed in the scenario description and shuffle them face down in a pile. Randomly select the harbor tokens, one at a time, and place them on the board where the scenario diagram indicates. Important Note: Do not use the smaller harbor tokens from the Catan game when playing with the Seafarers expansion! In order to travel from one island to another, you need to build ships. You cannot satisfy your hunger to expand with roads alone! The ship pieces in the game do not represent the individual ships, just as roads do not represent the actual carts and wagons that travel along your trade routes. Instead, the ship pieces represent a "shipping route". This is the route that ships use to trade and travel between the islands. To build a ship, expend 1 wool resource (to make sails) and 1 lumber resource (to build hulls and masts). Like roads, ships can only be placed on the boundary (hex side) between two hexes. Unlike roads, ships cannot be placed between two land hexes. You may only build ships between two sea hexes (forming an aquatic route) or between a sea hex and a land hex (a coastal route). You may not build a ship along a coast route if there is already a road along that hex side (and vice versa). When you build a new ship, you may place it adjacent to any settlement or city you have already built on the coast (see Illustration A). OR — you may place your new ship adjacent to any of your other ships that are already on the board (see the paths marked "YES" in Illustration B). When you place ships, any amount of branching is allowed, just like when you build roads. Since the ships represent established sea routes, they may not be connected to roads, nor can roads connect directly to ships (see Illustration C). You may only connect a land network of roads to a sea network of shipping routes if you first build a settlement where they come together. Ships and roads can be built towards each other; but even if they both reach the same intersection, they are not connected until you build a settlement there. Unconnected networks do not count toward the "Longest Trade Route". Roads and ships may not be built along the same coastline. There can only be one ship OR one road along any given coastal hex side (see the Catan rules on road building). Shipping routes act as roads across water (or along the coast). You build and place ships in much the same way as roads. They connect two adjacent intersections. A chain of connected ships of the same color form a "shipping route". Shipping routes act the same way as roads for expanding your principality. You can build new pieces anywhere that is connected to your network of roads and shipping routes. Count shipping routes when you calculate the "Longest Trade Route". If your shipping route reaches a coastline, you can then build a new settlement on that coast, even if it is a new island. Of course, you must still obey the "distance rule" from basic Catan, even if you are building on a new island. Once you build a settlement on a new island, you can use it as a base for further expansion, building new roads and ships (see Illustration D). A shipping route is either "closed" or "open." A "closed shipping route" is any unbroken line of ships that interconnects two of your settlements and/or cities. You may never move any ships that are part of a closed shipping route, even if that movement would not break the connection between the two settlements/cities. An "open shipping route" is any route that does not interconnect two of your settlements or cities. You may only move 1 ship per turn, and only during your building phase. You may not move a ship on the same turn you originally built it. When you move a ship, you must obey all of the usual rules for placing a new ship. You may only move a ship where one of its two ends is not adjacent to any of your other pieces. In Illustration D the ships outlined in white can move. So, none of the orange ships can move. Three of the red ships, and only one of the blue ships can move. Example: (See Illustration E.) Here are 2 open red shipping routes. The red ships outlined in white are the ends of their respective routes. In either case, you may move the ship outlined in white (as long as you didn’t buy the ship this turn). You may move the ship pointed to by the arrow to any of the edges marked "Yes". Catan chits fulfill different tasks in the individual scenarios. They can be applied as special victory points, serve as markers, or help to count the results. Many of the scenarios have goals other than expanding your principality. These goals can award a successful player special victory points. When you earn a special victory point, you receive a catan chit. Each scenario describes the rules for how to acquire these chits. When you earn a special victory point, you must place the corresponding catan chit underneath a settlement or city on the board. You must use the settlement or city that earned you the chit. This allows all the other players to see how many points you have earned, and how you gained those points. You earn special victory points in addition to the normal points you earn by placing a settlement or city. Example: In Scenario 1: Heading for New Shores, a player earns 2 victory point tokens when he builds his first settlement on one of the smaller islands. This settlement is then worth a total of 3 victory points: 1 for the settlement and 2 for the tokens. Because in Seafarers shipping routes are just as important as roads, players no longer compete for the "Longest Road". Instead, they compete for the "Longest Trade Route." The longest trade route is in all ways identical to the longest road (i.e., it is worth 2 victory points, etc. ), but players may count shipping routes (open or closed) as well as roads to determine who controls the longest trade route. The player with the longest continuous line of roads and/or ships receives the Longest Trade Route special card and the and the 2 victory points for it. Remember that you can only connect a road to a shipping route if there is a settlement or a city at the intersection where the two meet. Also, you can only count the single longest branch of a road and/or shipping route to calculate the longest trade route. Example: (See illustration F.) You have the longest trade route. The route includes 4 ships (a closed shipping route) and 2 roads, which are linked by settlement "A". You also constructed a shipping route starting from settlement "B". You can connect these 2 ships (an open shipping route) to your road if you build a settlement at intersection "C". This will increase the length of your trade route to 8. When playing the "Road Building" development card in a game of Seafarers, you have the option of building 2 roads, 2 ships, or 1 ship and 1 road. The gold field is a new addition to Catan! Eager gold prospectors discovered this valuable mineral on some of the islands around Catan! This gold rush can provide many opportunities to the clever player who is able to take advantage of it! The gold field hexes represent regions rich in gold nuggets. Gold itself cannot be used to build any pieces, so there are no gold resource cards in the game. Gold, however, is a very valuable medium of exchange. Whenever the number on a gold field hex is rolled, players collect resources for each adjacent settlement or city. As normal, each settlement is entitled to 1 resource, while each city is entitled to 2 resources. Players who are eligible for resources from a gold field hex may select ANY of the five resources (grain, lumber, ore, brick, or wool). They may choose any desired combination of these resources, up to the limit of 1 for each settlement and 2 for each city adjacent to the gold-producing hex. 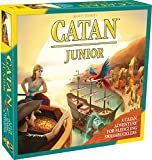 Some players will wish to get a jump on the opposition by first exploring the oceans around Catan. These foresighted leaders may elect to place either or both of their starting settlements on the coastline. If you do so, you have the option of placing a ship, instead of a road, adjacent to that settlement. This is an especially sound strategy if you are planning rapid maritime expansion. Just as the fields of Catan are troubled by the ravaging robber, the sea is vulnerable to the scourge of brigands! The dreaded pirate works the sea lanes for rich profit! If you roll a "7" during your turn, you may elect to move the pirate instead of the robber. Like the robber, you place the pirate in the center of any hex you choose — except that you may only place it on a sea hex. You are then allowed to steal one random resource from any one player who has a ship adjacent to that hex! If a player has more than one ship adjacent to that sea hex, you are only allowed to steal one card from that player. If you play a knight card, you now have the choice of moving either the robber or the pirate. Because sailors fear the pirate so, they will not sail near him. You may not place any new ships on the border of the hex the pirate is on. In addition, no ship may be moved away from the pirate if it is on the border of the hex in which the pirate is sailing. Note: In Seafarers, certain scenarios contain no desert hexes. In such cases, start the robber off the board (just like the pirate).